Why do our bodies matter to our faith? 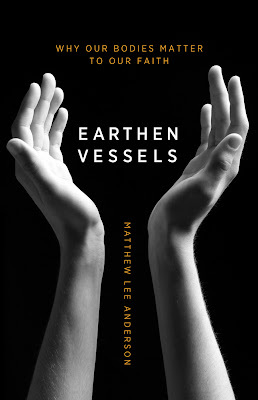 This is the beautiful prose found in the summary of Matthew Lee Anderson’s new book Earthen Vessels. It’s beautiful not just because of the fine literary construction but because of the beautiful Truth it conveys. Anderson’s book explores the beauty of the body, this image of clay, and the disregard it’s been given in Christian circles throughout history and why the Bible teaches a different story. Life on either side of eternity is embodied. And while we struggle with sins of the flesh, we ought not forget that though corruptible today, this flesh will be raised up incorruptible one day. We also would be wise to remember that our bodies are not our own. They were made by the Potter’s hand, and they are the Temple of the Holy Spirit. They ought to be treated as God wills and not in ways we think is best. On the more critical side of things, I did find Anderson’s book a bit highbrow. I think its place would be more at home on an Academic reading list in seminary than as a $15.00 choice at the local Christian bookstore. If I had to wager, I’d say this is a Master’s of Divinity Thesis or a Theological PhD dissertation that made it to publication. There are a lot of deep Truths to be uncovered for the diligent reader, but unless you’re into grueling hours of late night study with looming final exams, I’d take a pass on Earthen Vessels. I received this book from Bethany House Publishing for review. All opinions are my own.